If someone had told me a year ago all of the wonderful things that 2010 had in store for me, I would have approached the year with wonder and excitement. From helping to send blankets to a Russian orphanage, chasing down a loose pony, having the privilege of helping my friend adopt an orphaned child in need of a loving family, and finally getting to "meet" Saloma who I admired for years without her ever knowing it, 2010 held more unforeseen blessings than a sunny day. However. If you had also told me that I would spend five days in the hospital and several weeks, months, recovering from a vicious staph infection in (of all places) my right hand, I would have boycotted 2010, and never left the house. It's a good thing I didn't know! So as the year ends, I approach the new one not with promises, resolutions, or carved-in-rock goals. As I'm fond of saying, we make plans and God laughs. In keeping in line with that thought, I choose to approach 2011 with a sense of wonder of what blessings and adventures God will have in store for me in the new year. Who else will I meet? Whom can I help? How will I contribute to God's kingdom? I am constantly open to learning new things and expanding my skills, and make an effort to do so constantly. Working in an environment filled with educational opportunities, how could I not have a love of learning? No doubt there will be many opportunities this coming year to do just that. 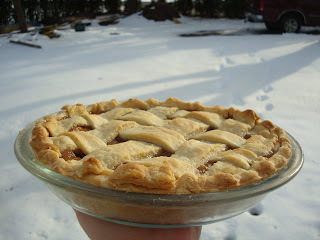 I'm ending pie month with a very traditional pie, one you rarely see outside of Amish/Mennonite communities. Shnitz pie is made from dried apple slices, which are then soaked in water, boiled, strained, and spiced. Thanks to cousin Elizabeth who invested in a food dehydrator last summer, we have dried apple slices, green beans, and even chopped okra. It sure saves space! I'm willing to bet that generations ago many people preserved their apples by having an old fashioned apple schnitz (apple cutting bee) and drying them, and that is likely how this pie came about. And while I have quite a few recipes for this pie, they almost all yield more than one pie, so I developed this one which yields one old-school tasty and sweet but not too sweet Schnitz boi. a pinch each of: ground cloves, all spice, and salt. A "pinch" here is about 1/8 of a tsp. 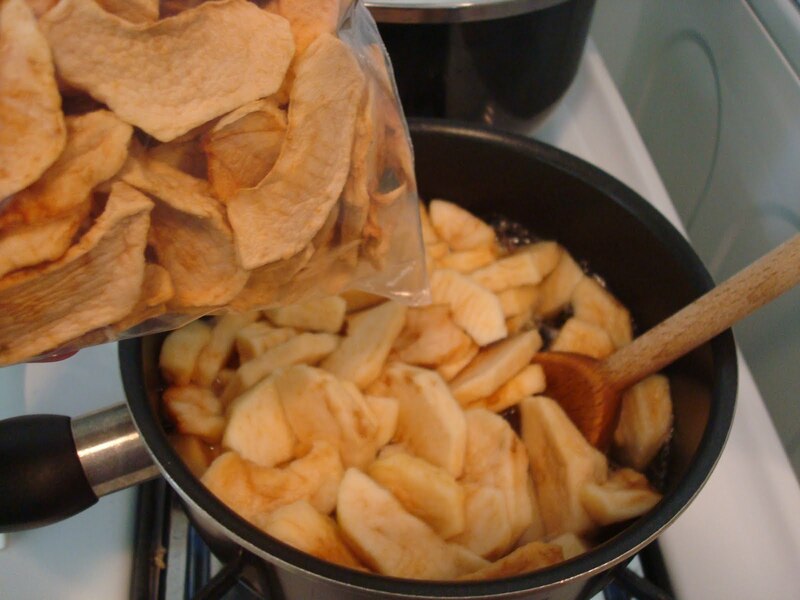 Soak your apple slices in water over night. This will hydrate them slightly. Dried apple slices in the bag, soaked schnitz in the pot. Then, go ahead and boil the apples until they are soft. You will notice they are fully hydrated and can be sliced easily with your stirring utensil. It will look sort of apple-saucey, but with some visible apple slices. 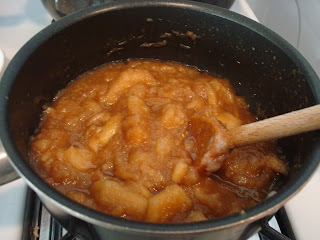 Drain this through a strainer, then return your apple filling to the pot. Add the apple sauce, brown sugar, and spices, and cook till everything is combined and slightly thickened. I achieve this by cooking it over high heat for just a couple minutes. If you find that it's still too runny, then add a little pectin (clear jel) to thicken it up. Pour into your unbaked pie crust, and cover with a top crust. 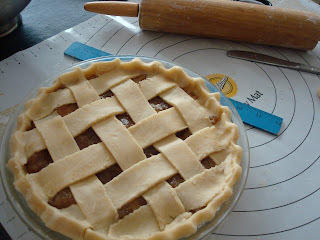 I did a lattice crust this time, but you can do a full top crust. Bake at 425 for 15 minutes, and then reduce heat to 375 and bake for another 30 minutes. This one had to be cooled fast, so we could have it tonight! My one regret about pie month is that I did not get to make a crumb-topped fruit pie, which is my favorite and probably what we eat the most around here. If you're still in the mood for pie, don't forget my Shoo-fly tutorial and Chocolate Peanut Butter pie. But I think after a month of pie, I'm ready to move on. Hmmmm.... any sort of apple pie is a huge hit in my home. This one I'll have to put at the top of my list to try. I love your attitude about facing the years. I just wrote some things in my prayer journal that I hope to see answers from God for 2011. Sometimes He just outdoes Himself with bless us. I started reading your blog after Beth from imPerfect Housewife posted about you. Great blog! You make the prettiest pies! My crimped edges always puff up so thick, I lose the details of my crimping. They taste great, and have lots of delicious flakey crust, but don't look so pretty. I will have to try this pie, but probably with a crumb topping. ;) I'd have to hide the Schnitz as little folk really like to gobble it up, whenever I buy any. Batmom- I actually like a little puffier crust, and am a little disappointed when I open the oven to find a crimped but anemic edge! Your pie looks delicious. The only dried fruit pie I have ever made is Raisin Pie. I read in the paper this week that pies are going to be the new "In" dessert for the coming year, replacing cupcakes in popularity. So, it looks like you are ahead of the trend! Schnitz Pie and Apple Pie are two different pies in texture and flavor. That's correct, Katie. This is not like a regular apple pie, and perhaps I should have made that clear in the post in case there is any confusion. Schnitz boi... what memories that brings back! In my home community, my mother was about the only person left who made them, when I was growing up. I wonder if anyone else has taken up where she left off? Monica, you must be absolutely the best cook, ever! Do you ever make anything that doesn't look and taste delicious!? Happy New Year, Monica. And thanks for mentioning my name in your posting. So thoughtful. This looks so delicious! It has been a long time since I made some in the kitchen! Thanks for this one! Great stuff here. Happy new year to all! What a lovely blog! I have wandered around too long here tonight. It is almost 1 a.m. I've enjoyed reading several of your post, and this one really made me homesick for my Grandmother. She used to dry apples on the back shelf, behind the back seat of her car. The car kept the bugs from getting into the apples, but the sun shone in and did a lovely job of drying them. A side benefit was her car smelled wonderful! She made fried apple pies, and also crumb topped apple pies, both were divine! I'm bookmarking this post and will have to try this recipe soon! Thanks for sharing the recipe!